It’s that time of year, y’all… time to Celebrate the Boy! Can I tell you a secret? I think this is my favorite series in blogland. Dana and Rae are geniuses! 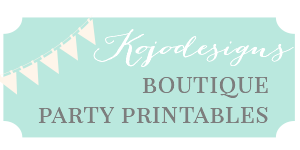 Since I always kind of saw myself as a ‘girl mom,’ I’m much more comfortable making dresses and accessories and goodies for GIRLS (just ask my sister/sister-in-law who receive way. too. many. dresses for my nieces). 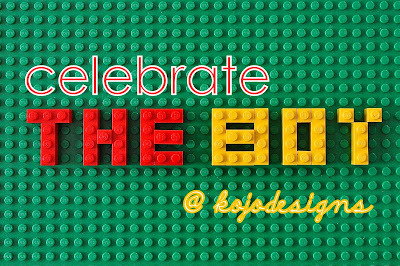 Celebrate the Boy is the perfect catalyst for branching out from my natural tendencies to make things for boys instead! How fun! Which brings us to today’s tutorial! Recently, I was making a little pieced jersey dress for Piper Jane (surprise, surprise). When I looked at the pieced jersey patchwork, I decided to put together some pieced jersey pants for Burke as well. And I love the way they turned out! 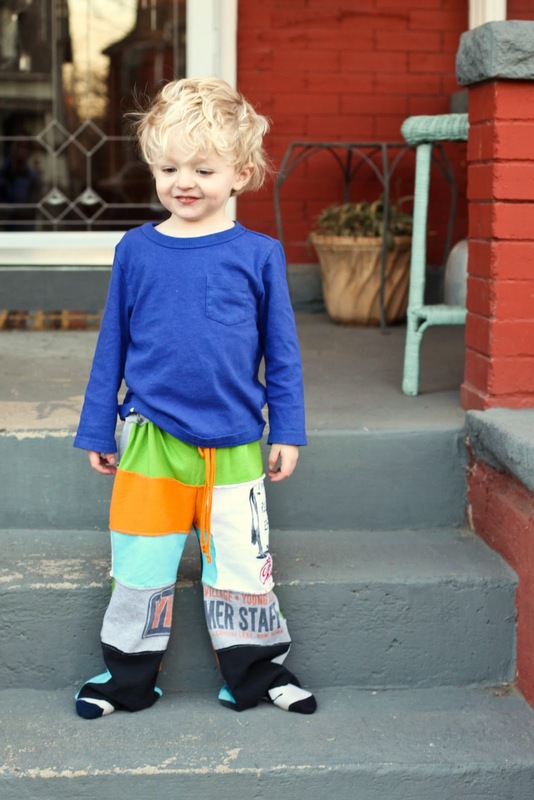 The soft jersey from the t-shirts makes them extra cozy, the drawstring makes them cinch-able on Burke’s little skinny waist, the exposed seams and color make them bright and modern. Plus he loves them- always a huge bonus! 1. Cut out rectangles/squares of jersey. Lay them out, matching up the pieces so that when they’re pieced, they make a rectangle. Pin in place. Note- to make the seams show, pin together with the wrong sides facing each other. 2. Sew into pieced patchwork rectangle. A good thing reminder to ensure exposed seams is that you’ll be sewing onto the fronts of the t-shirts. 3. Fold the pieced rectangle in half. 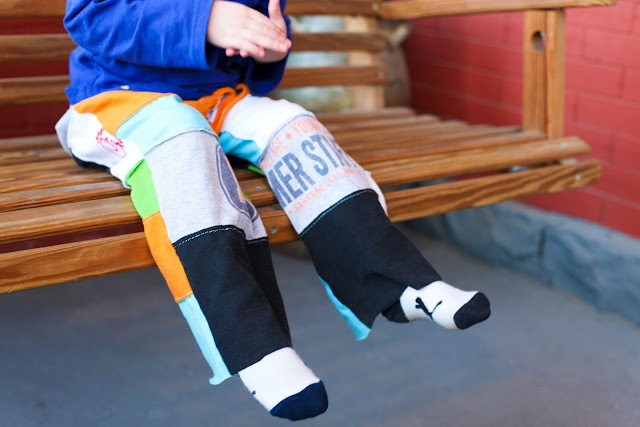 Lay a folded-in-half pair of pants that fit your little guy on your doubled over rectangle. Trace around the perimeter of the pants. Now flip the pants over and do this again (so you’ll have two pairs of pieces when you cut everything out). When you’re tracing the top of the pants, stretch out the elastic and trace. Add at least an inch to the top of your tracing and the bottom of your tracing. 4. Cut out the pieces you traced. They’ll be exactly the same at this point (we’ll make the front a little lower when we sew the drawstring casing). 5. Pin the ‘front’ and ‘back’ pieces of each pant leg together). At this point, you’ll have a pinned together right pant leg and a pinned together left pant leg. Sew the outside seams of each pant leg together. Note- these seams aren’t supposed to be exposed (it just looks cleaner), so pin and sew together with the ‘right’ sides facing in. Then sew up the inside seam of each pant leg. 6. Once the outer and inner seams are sewn, pin the crotch pieces together (again, right sides facing in). Stitch down the curved seam where the crotch meets up in the front and then in the back. 8. Make two little teeny slits in the front of the casing (since the fabric is jersey, these don’t have to be finished). Cut a long, thin strip of jersey to act as your drawstring. Attach a pin to one end of the drawstring and pull it through the casing. You might want to try them on your little one at this point and either hem the bottoms (this will make them last longer because you can let out the hem later) or trim to the appropriate length. 9. Done! 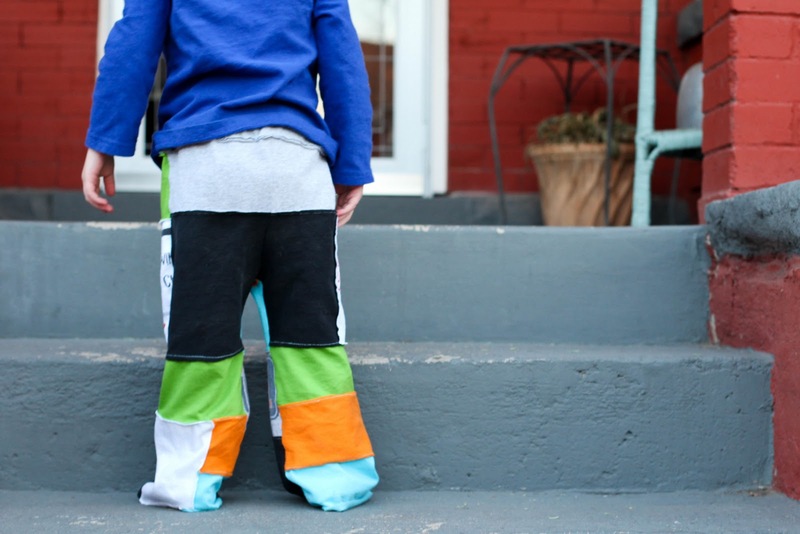 A new pair of cozy, comfy, bright, modern pants for your little man! Thanks for joining us to Celebrate Boys! 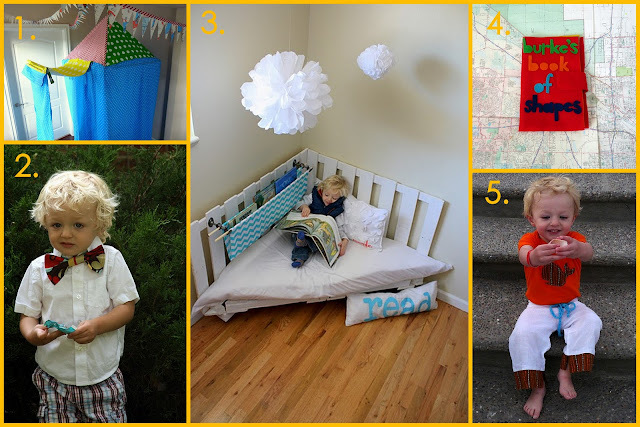 While you’re here, want to check out a few other fabulous boy projects? 1- Burke and his friends LOVE his hanging tent! 2- Bow tie for little guys. 3- Reading nook made from palettes– the perfect spot for cuddling up with a good book. 4- This felt book has been more helpful on airplane rides and car trips than I can tell you. Every time Burke has a new ‘love’ (walruses, Elmo, gorillas, etc. ), I make one for his felt book. 5- Upcycled linen beach pants. So cool and great use of old t-shirts! these are absolutely adorable!!! love love love them!!!! thank you so much for sharing! Ladies, those are ADORABLE!! 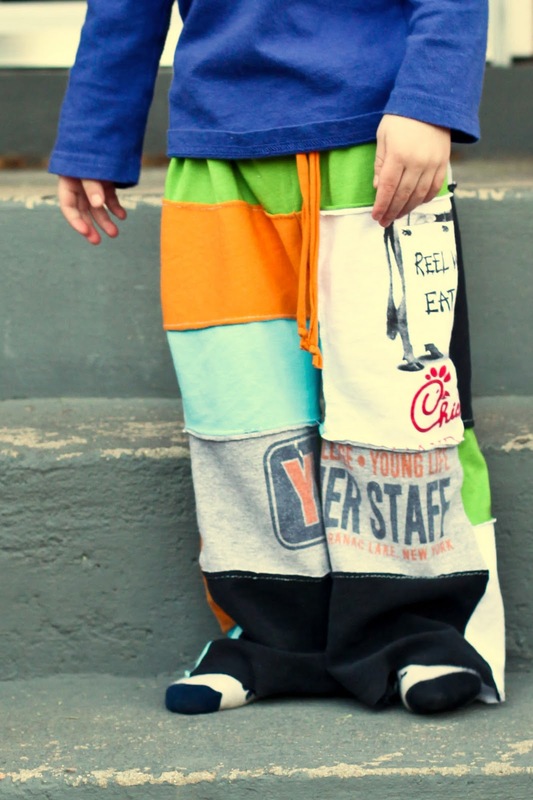 You know I don't have boys, but I might just need to have one to make these pants – LOL. I guess I could tweak them for a girl. But, seriously – SO cute!! I love these! My poor little man doesn't get nearly as many handmade items as his baby sister. He just outgrew a few of his favorite t-shirts. Now I know how I want to reprupose them! These pants are adorable! I actually want to make a pair for myself out of all my old tees. LOVE, LOVE, LOVE these pants. I will have to gather all my knits now. These pants are adorable! I have to confess, I came for the boy, but I think I am leaving with an idea for me! How comfy, great for when we're out walking! Thanks! On Step 3, won't you need to fold the rectangle into fourths and not in half? Seems like the rest of the instructions are assuming you cut out 4 pieces, not just 2. Thanks! Can't wait to whip up a pair of these! oh my word! these are the cutest things! I have so many shirts for my daughter's dresses that I was secretly dreading making another.dress. Now I have an excuse to whip them out! Thanks for the idea! these pants are fabulous! thanks for sharing!! LOVE those pants!! Definitely going to make them for my little man when he arrives! Thanks for the tutorial! LOVE these pants! I have a feeling that all 3 of my boys will want a pair…thanks! absolutely adorable! these are definitely going to be made soon! 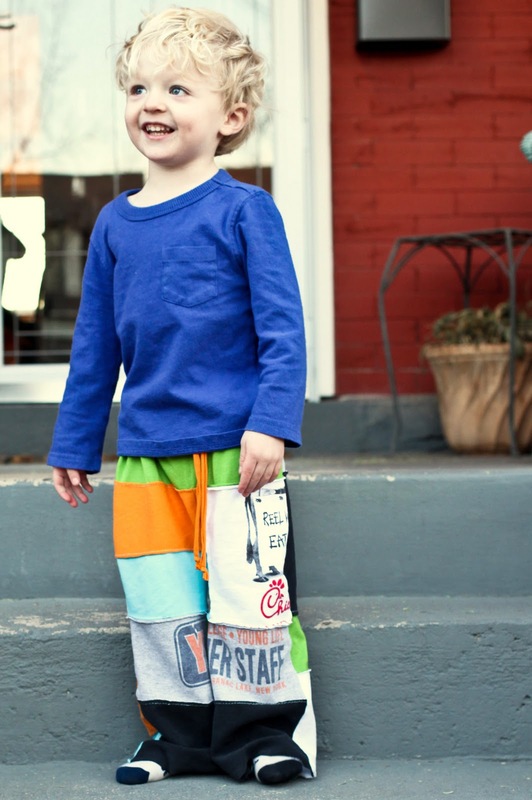 especially now that my little one is just a tad too big to make pants out of just one t-shirt… perfect solution! Absolutely in love with this idea! I'm in with the other commenters, I'm making a pair for myself with some old t-shirts I've saved from childhood! I'll let you know how it goes. Thanks for sharing the idea. i have all boys (2) and a new one coming. You're genius for coming up with this creative idea. Definitely gonna make it! Good gracious, these are so goshdarn cute. Can't wait to get started! oh these are SO GREAT!!! 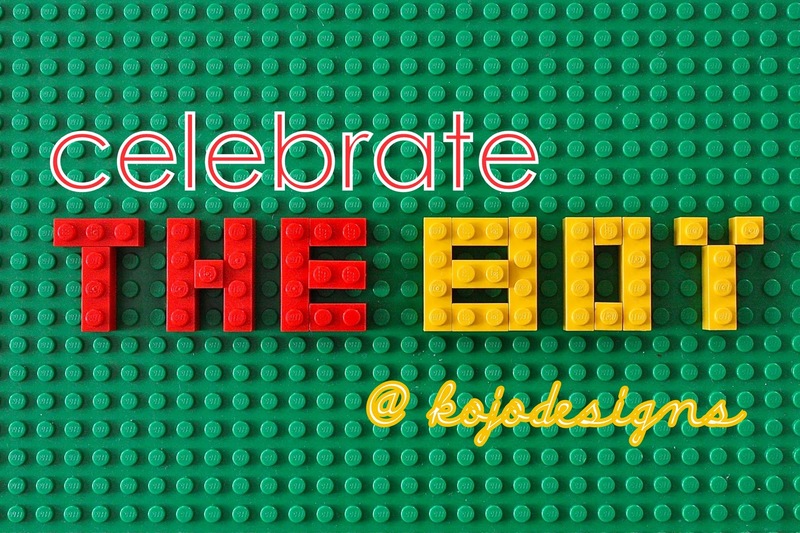 You guys are awesome (also you get the prize for nice incorporation of our lego images into your post…very nice, nice!). I absolutely love these pants! I cannot wait to make a pair for my boys and just maybe a pair for myself. They look extremely comfy! Great idea! What fun it was to dig through our old t-shirts and make these pants for our boys! Thanks! 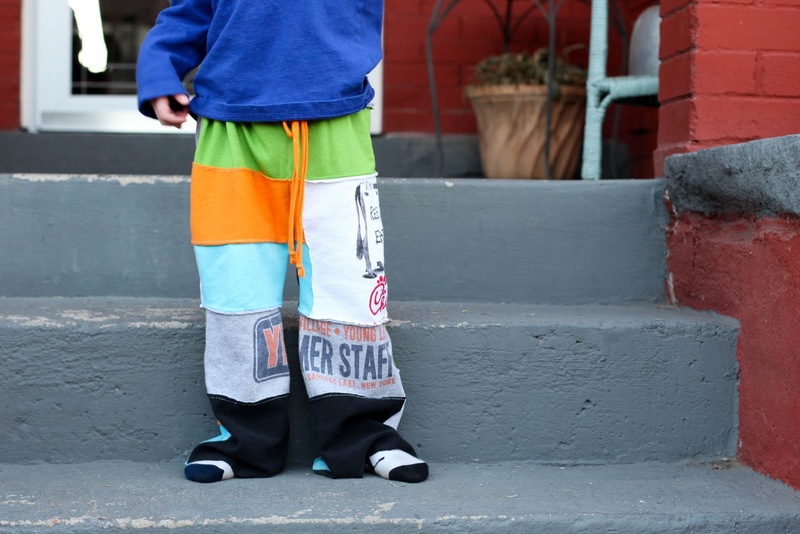 I made the pants for my son and he loves them. Thanks for the great idea! I made one pair for my 3 yr old and then my 7 yr old insisted on a pair too. I can’t wait to get to make my pair! This may be a stupid question, but what exactly is “jersey material”? Is it like a normal t-shirt, 100% cotton, or something else? I saw these and would love to make them. Thanks for the help!! Yep, t-shirt material! 🙂 Not a stupid question at all! LOVE the young life summer staff shirt!!! Awwww, me too Jenny! Me too! Might try to make a pair of these for my son since he is always feeling left out with all the stuff I make for his sister. Plus, I had to check out the project when I saw a YL Summer Staff tshirt … I have the same tshirt! Melissa, I love this! And that shirt is old school- where were you on summer staff?? ?